Click image to enlarge Crims Island, Oregon. Upstream tip of Crims Island, as seen from upper road near Mayger, Oregon. 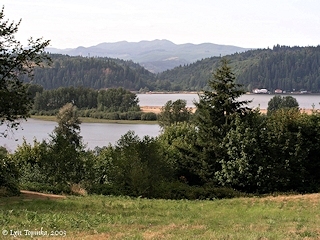 The Washington community of Stella is along the Washington shore, right side of image. Image taken August 2, 2003. 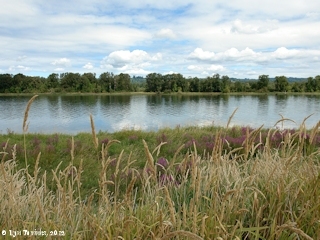 Crims Island is a three-mile long island located near the Oregon side of the Columbia River at River Mile (RM) 54. Crims Island is approximately four miles upstream of Wallace Island, and Stella, Washington lies across from Crims at RM 56. Upstream of Crims is Fisher Island off the Washington shore and Walker Island off the Oregon shore. 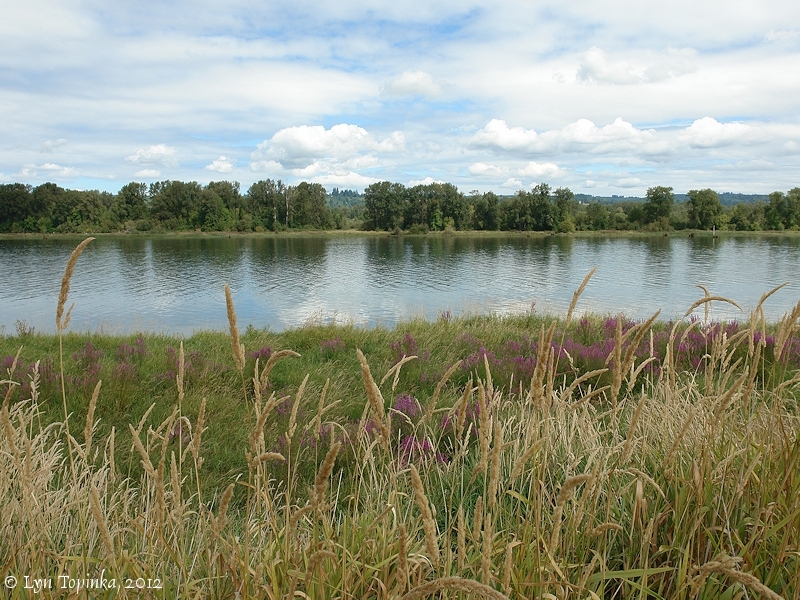 Bradbury Slough heads off from the Columbia River at Mayger, Oregon and separates Crims Island from the Oregon shore. The lower end of Crims, where Bradbury Slough merges back with the Columbia, lies the impressive cliffs of Oak Point, Washington. 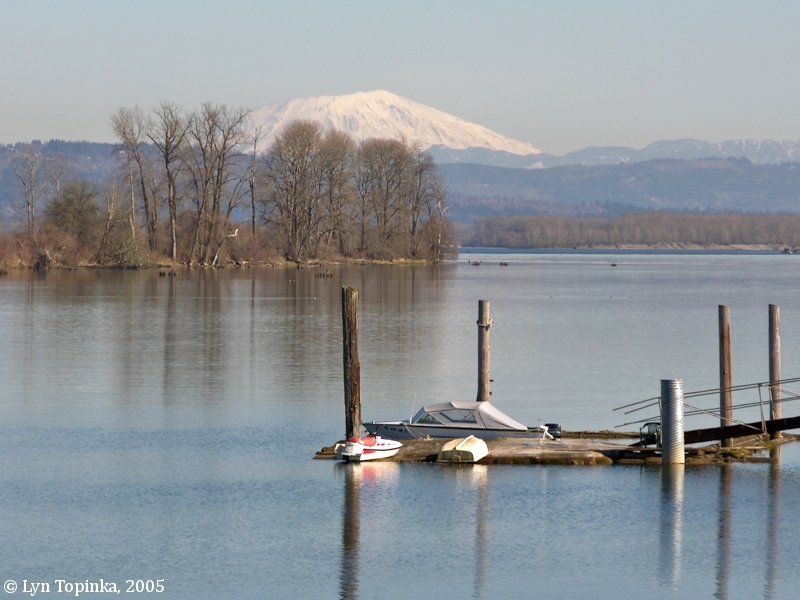 Lewis and Clark first pass Crims Island on November 6, 1805, and then again on their return on March 26, 1806. 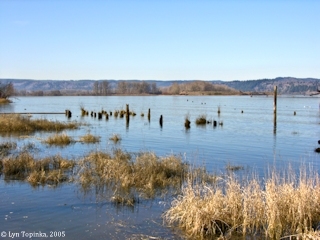 Bradbury Slough runs on the south side of Crims Island, separating the island from the Oregon shore. 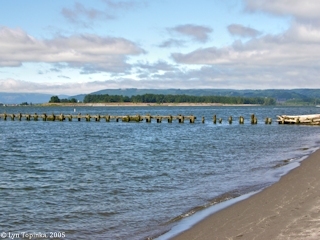 The main Columbia River shipping channel is on the north of Crims Island. Bradbury Slough and the one-time railroad station of Bradbury (later re-named Locoda), were named for Clement A. Bradbury, an early settler. On October 26, 1792, William Broughton of the George Vancouver Expedition, named Crims Island "Baker's Island" for a Second Lieutenant in Captain Vancouver's command. Lewis and Clark, on their journey to the Pacific passed by Crims Island on November 6, 1805, however they did not name it. On the return trip, the men called the island "Fanny's Island", presumably named after William Clark's younger sister, Frances. In 1841 Charles Wilkes of the U.S. Exploring Expedition named the island "Gull Island" in 1841. Today's Gull Island is now the small 1/2-mile long island north of the west end of Crims Island. Today's Crims Island is named after James F. Crim, a pioneer homesteader on the island in the 1870s. In 1927 the U.S. Board of Geographic Names made official the name "Crims Island". Other names previously seen in use were "Grims Island" and "Gull Island". The U.S. Bureau of Land Management, General Land Office Records (GLO), show a James F. Crim being issued a land title on February 10, 1871, for 147.25 acres of parts of T8N R4W Sections 13 and 14, under the 1862 "Homestead Entry Original". The U.S. Coast and Geodetic Survey Chart #641 published in 1888, calls the island "Grim's Island". On current USGS topographic maps and NOAA nautical charts, the Crims island complex is split into "Crims Island" (the main island on the south), and "Gull Island" (a smaller island to the north side of Crims), and two smaller unnamed islands off the upstream tip of Crims Island and one off the downstream tip. The area to the south is a flat delta containing many sloughs, including the Clatskanie River/Beaver Slough, and Westport Slough which drains the western half of the delta. 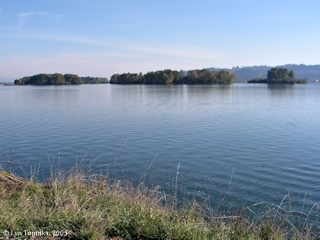 Click image to enlarge Crims Island from Washington Highway 4. 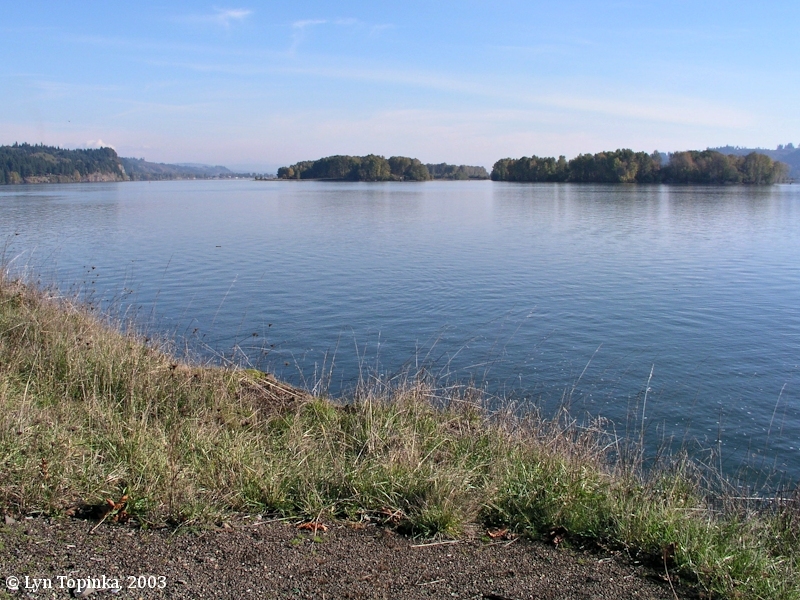 Downstream tips of Gull Island (left) and Crims Island (middle), as seen from Washington State Highway 4. Image taken July 28, 2005. 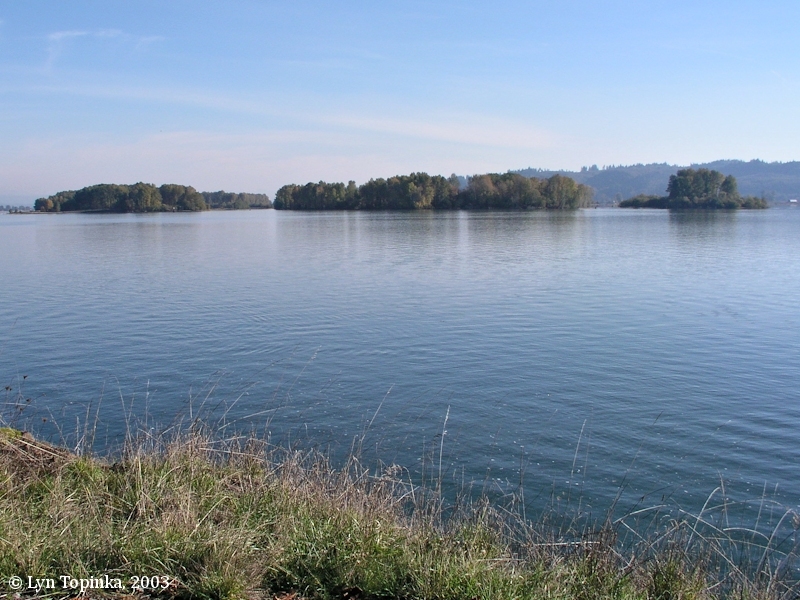 Click image to enlarge Gull Island and Crims Island, downstream tips. 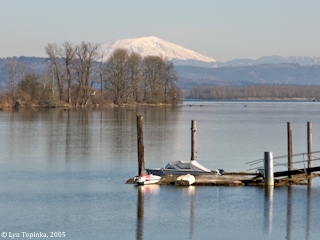 Downstream tips of Gull Island (left) and Crims Island (right), as seen from Washington State, just downstream of Mill Creek. Image taken November 9, 2003. 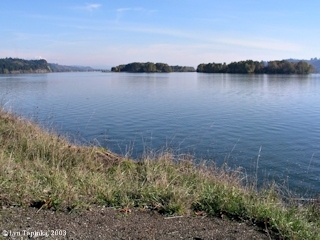 Click image to enlarge Crims Island, Oregon, downstream tip. 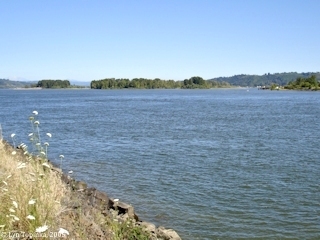 Downstream tip of Crims Island, as seen from along the Washington banks of the Columbia River. Gull Island is to the left. Image taken November 9, 2003. 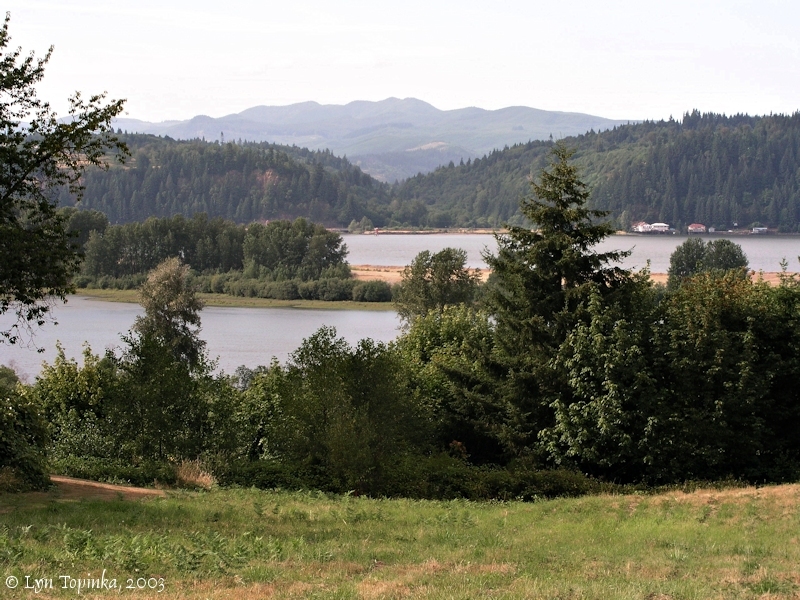 Click image to enlarge Upstream tip of Crims Island, as seen from Mayger, Oregon. Image taken February 21, 2005. Click image to enlarge Mount St. Helens, Washington, Crims Island, and Bradbury Slough, Oregon. Crims Island is on the left. Image taken February 21, 2005. 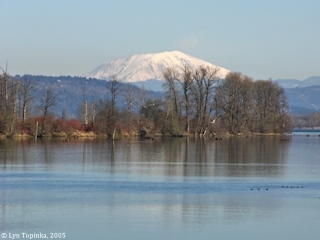 Click image to enlarge Mount St. Helens, Washington, Crims Island, and Bradbury Slough, Oregon. Crims Island is in the middleground. Image taken February 21, 2005.